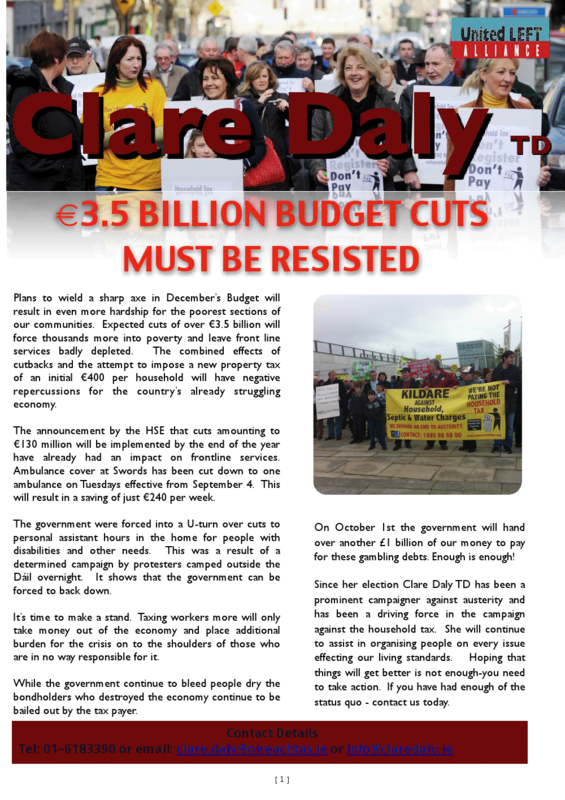 The Autumn 2013 Newsletter from Clare Daly of United Left. It attacks the recent Budget, water meters and Pyrite. 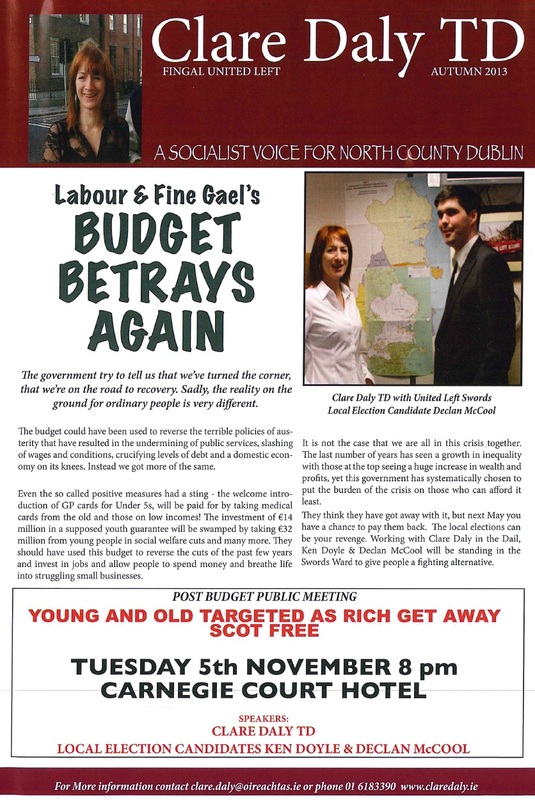 It also introduces the Swords United Left candidates for the 2014 Local Elections Declan McCool and Ken Doyle. Thanks to all my constituents, friends and colleagues who took the time to send messages of support during the recent vicious smear campaign following my resignation from the Socialist Party. 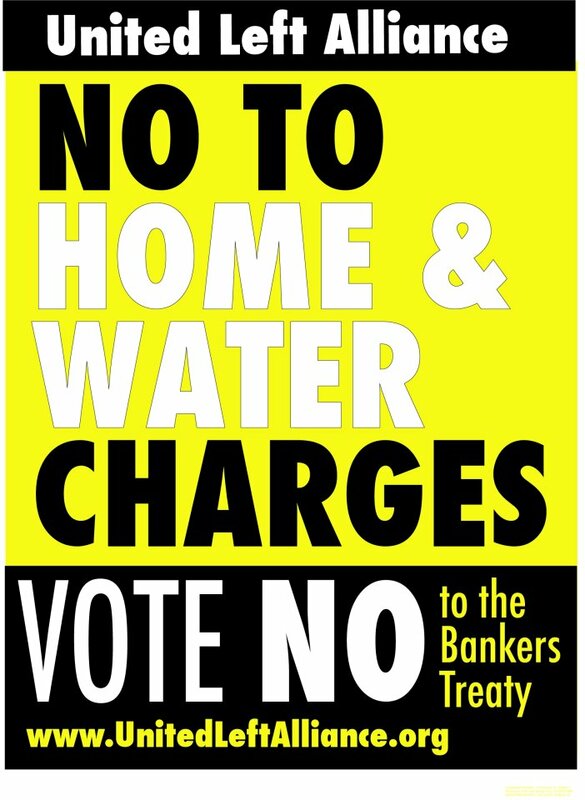 Less there be any doubt, this had nothing to do with any support for Mick Wallace’s company’s under declaration of VAT. I have clearly stated that this should not have happened and that the money should be repaid. An arrangement has been made in that regard. The Budget in December will contain further cuts in health, education, social welfare and council services, while taxes will be increased. No one will escape the coalition’s austerity agenda. As the only opposition TD in Dublin Fingal I will use that platform to step up the ﬁght against government at a local and national level, with the same principle, passion and intensity as I have over the last 18 years. To that end I will work with the other ULA TDs and activists, to build it into a more campaigning and substantial force than it has been to date. I will be hosting meetings in the coming weeks to outline plans for the future. If you are interested in working along side me on any issue or joining our team please see contact details below. 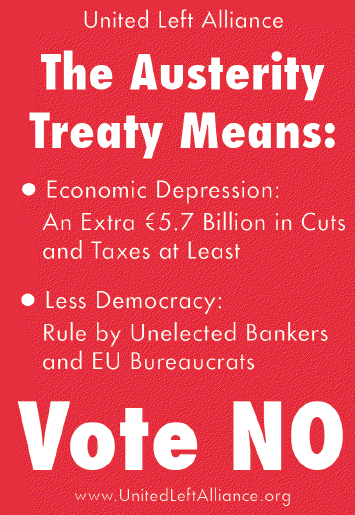 From the Fiscal Treaty Referendum two posters urging a No vote from The United Left Alliance. 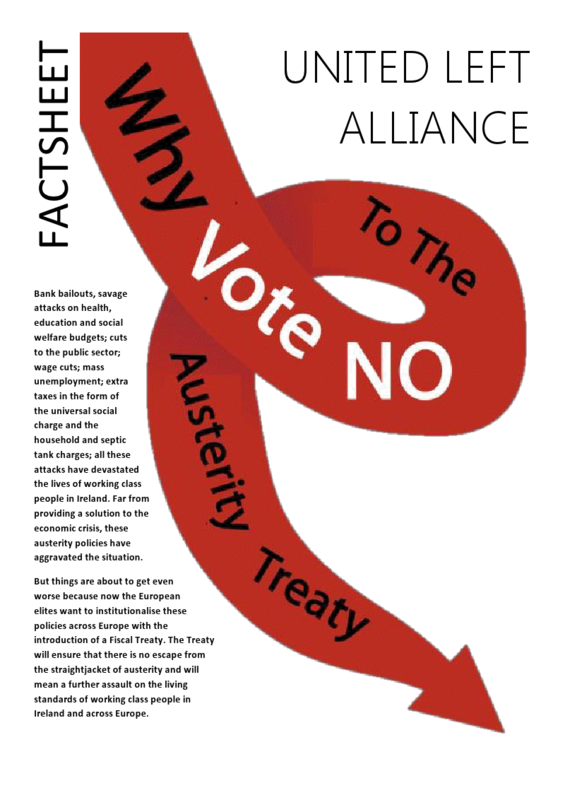 From the Fiscal Treaty Referendum campaign a leaflet from The United Left Alliance looking for a No Vote. 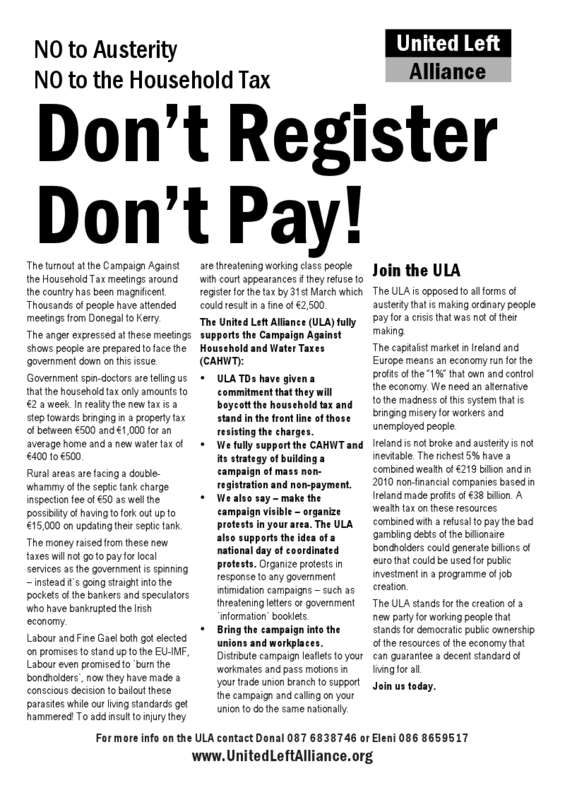 ‘Don’t Register , Don’t Pay!’ an Anti Household Tax leaflet from the United Left Alliance. 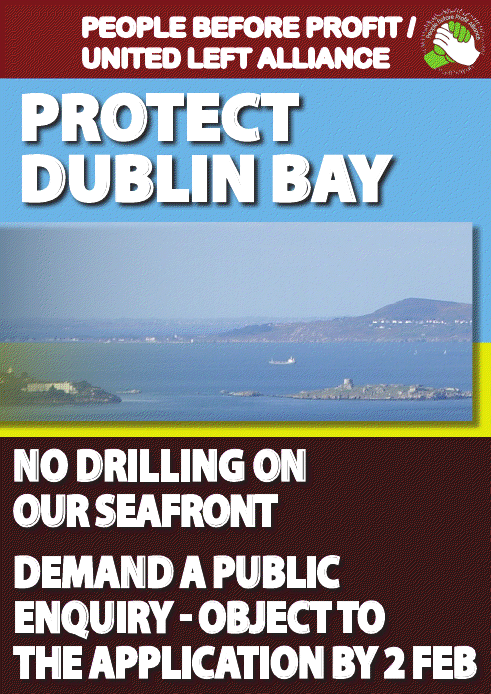 “Protect Dublin Bay -No Drilling on Our Seafront” another leaflet against the proposed Oil Drilling in Dublin Bay, this time from People Before Profit / United Left Alliance TD Richard Boyd Barrett.